It is a sight to see: A gigantic tower with a crane that appears to be floating completely free over a hundred metres up and almost disappearing into the clouds over the Limpurg hills. If you could imagine the perfect location for a wind turbine, it would probably look a lot like this. Soon after our visit, the giant tower was crowned with a nacelle and three rotor blades. They convert the power of the wind into 3.4 megawatts of electrical power. The turbine is designed to harvest more than 10 gigawatt hours of energy per year, enough to supply around 2500 four-person households. The three other wind turbines, which stand like sentinels on the hill a few hundred metres apart and are only a few metres lower, have an identical design and deliver the same power and energy. The plant in Gaildorf near Schwäbisch Hall is an ambitious contribution to the energy revolution. It has immediately set several records: The highest of the four turbines is currently the highest in the world, with its hub at 178 metres and the tip of the rotor reaching to a height of 246.5 metres, thanks to the hybrid concrete (lower section) and steel (upper section) tower. Every metre counts, as it increases the energy yield. The lower section of the huge towers has a significantly greater diameter than the upper section of the tower and stands in a huge circular reservoir. When there is excess wind power or electricity in the grid, this electrical energy is used to pump water up and into these two reservoirs. When electricity in the grid is scarce, the water drops 200 metres down into the valley and powers two Voith turbines. The principle of the pumped-storage power plant is almost 100 years old. What's new here is that a plant for generating renewable energy and a pumped-storage system are at the same location, in fact they are housed in the same construction. The “water batteries” are connected by a two metre thick pipe that runs into the valley under the bed of the River Kocher and into a specially created lower reservoir. Upon taking up full operation in late 2017, the system was filled with 160,000 cubic metres of water from the river. The combination of wind energy and pumped-storage technology in this project is complex and extremely challenging. GE Renewable Energy supplied the four wind energy plants, each with a rating of 3.4 megawatts. The company has stringent requirements in terms of the electrical equipment, including the cables in the nacelle and the tower. Lapp has already supplied cables for the nacelles in other GE plants and is listed as an approved supplier. 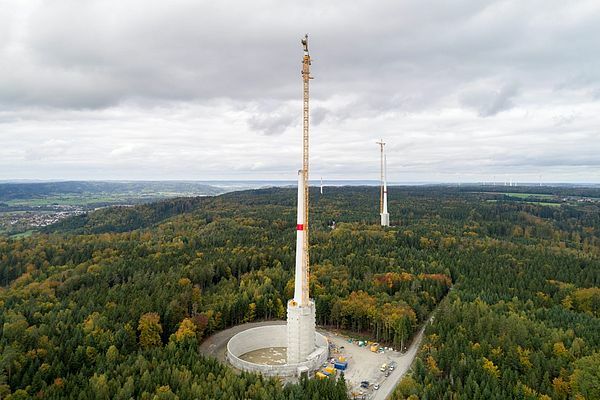 Therefore, the company was approached by Max Bögl Wind to supply the cables for the tower in Gaildorf. “We receive a specification from GE, which lists the exact specifications for each cable, including dimensions, temperature, torsion and weather resistance, and much more”, says Andreas Müller, the main responsible for the wind power sector at Lapp. Lapp completed the order on time. In a container at the construction site, the last medium voltage cables are waiting on large wooden drums to be hoisted up into the tower, where industrial climbers on cables suspended inside the cable will pull up the cables and secure them in a wire frame. In a second adjacent container, some of the total of 100 drums are waiting empty for return transportation. Generation and storage at the same location is a big trend: Half of the photovoltaic units in Germany is now sold with a storage battery. Solar energy from the roof and storage in the cellar gives consumers independence from rising prices and contributes to stabilisation of the grid. Generation and storage in a single location could now become the norm in the wind power sector too, as there is an urgent need for storage when an increasing amount of fluctuating wind power is being fed into the grid to replace the more constant and predictable production from coal, gas and nuclear power plants. “With the water battery and hybrid towers, we are making wind power even more attractive and efficient as an energy source, setting new records at the same time”, says Josef Knitl, CEO of Max Bögl Wind AG. The natural energy storage in Gaildorf is the cutting edge of the concept. The three turbines in the valley generate 16 megawatts and the capacity of the storage is 70 megawatt hours. This enables them to compensate for up to 5 hours of calm, but also to cover shorter discrepancies between generation and demand in the grid. Switching from feeding into the grid to storage or vice versa takes just 30 seconds. This increases flexibility and opens up additional sources of income, as the plant can offer well paid grid services to compensate for instability and changes in the grid frequency or to provide idle power.